Telemedicine programs bring ophthalmic care to remote populations and others who lack access. Canada is the second largest country in the world, with a population of only 36 million people. Many Canadians live in remote communities at great distances from large urban centers. Although indigenous patients (Inuit, Metis, and First Nations) are found in metropolitan areas, a large proportion of them live on ancestral homelands in small rural communities distributed across central and northern Canada. Despite access to universal health care, those living in remote communities face barriers to eye care due to geography and the costs and difficulties of travel. Canadians living in the large cities may also face barriers to specialty eye care. For many living in inner cities, access may be difficult due to social isolation, lack of education, the requirements of full-time work, or lack of a family doctor. • Teleophthalmology can alleviate travel burdens, saving patients and medical systems time and money. • It can improve access for at-risk populations by providing direct access to ophthalmic care from a distance. • Teleophthalmology programs can also support research efforts. In these programs, using store-and-forward technology, trained ophthalmic photographers would capture anterior segment and retinal photographs while trained technicians would record medical history, visual acuity, and intraocular pressure. Access to high-speed internet in most communities across Canada allowed secure web-based sharing of information. All Canadians are supposed to have universal access to health care, regardless of geographic location. Provincial governments fund health care, and the federal government funds health care–related travel and accommodations for most indigenous people. Government funding agencies look with favor upon tools that improve access to and quality of health care while reducing overall costs. Canadian teleophthalmology programs have expanded and multiplied over time with stable government funding. This funding has supported the purchase of equipment, the salaries of photog-raphers and nurses who perform teleophthalmology examinations, and the fees for physician graders. Physicians performing clinical assessments via telemedicine must be licensed in the province where the patient is remotely assessed. Liability coverage for examinations by telemedicine is provided by the Canadian Medical Protective Association under the umbrella of medical care. Most provinces and territories in Canada support regional teleophthalmology programs. These programs link small regional hospitals to large urban centers in a spoke-and-hub model. Patients with diabetes are referred by their family doctors for retinal photographs, intraocular pressure measurements, visual acuity testing, and short medical histories. The retinal images and clinical data are then uploaded onto a secure website for review by an ophthalmologist, and patients with vision-threatening diseases are referred accordingly. Figure. In the winter, many communities in Northern Canada are accessible only by ice-roads. Many indigenous communities in Northern Canada do not have year-round road access. Instead, these communities are accessible by plane or boat in the summer and by ice-road in the winter (Figure). Many indigenous people have diabetes. To reach them for teleophthalmologic care, mobile camera units travel by truck, boat, or plane to health centers on reserves with a trained technician. • More than 5.5 million Canadians have a major eye disease that could lead to vision loss. • An estimated 1.4 million Canadians have AMD, which is the leading cause of vision loss in the country. • Other significant causes of vision loss include diabetic retinopathy, glaucoma, cataracts, and refractive error. • The prevalence of vision loss in Canada is expected to increase by nearly 30% in the next 10 years. Source: Canadian National Institute for the Blind. Fast facts about vision loss. www.cnib.ca/en/about/media/vision-loss/pages/default.aspx. Accessed February 5, 2018. Age-related macular degeneration (AMD) is the leading cause of irreversible vision loss in Canada.18 Many patients present in late stages of disease because they have not had annual eye examinations. Teleophthalmology improves early identification of treatable disease and streamlines treatment once patients are diagnosed. As an example, a person who is diagnosed with wet AMD via teleophthalmology at an optometrist’s office can easily be referred to a retina specialist, who can then arrange for fluorescein angiography and optical coherence tomography imaging to be performed upon the patient’s arrival. The retina specialist can then review the tests, examine the patient, confirm the diagnosis, and, if needed, treat the patient in a single visit. In a country where patients may need to travel more than 1000 km to see a retina specialist, such an improvement in efficiency is vital. Teleophthalmology can be used to bring multiple specialists together to assess patients with hereditary retinopathies. A geneticist, electrophysiologist, and retina specialist can review clinical history, retinal photographs, and electrophysiologic data, including full-field electroretinogram and/or multifocal electroretinogram, via a secure website at the University of Alberta in Edmonton. Each specialist is able to comment on the diagnostic results and clinical findings, and a summary report can be generated. To date, this service has provided diagnostic assistance to more than 1500 patients with genetic diseases of the retina, with a total of more than 2000 teleophthalmology assessments. Teleophthalmology can alleviate travel burdens, saving patients and medical systems time and money. 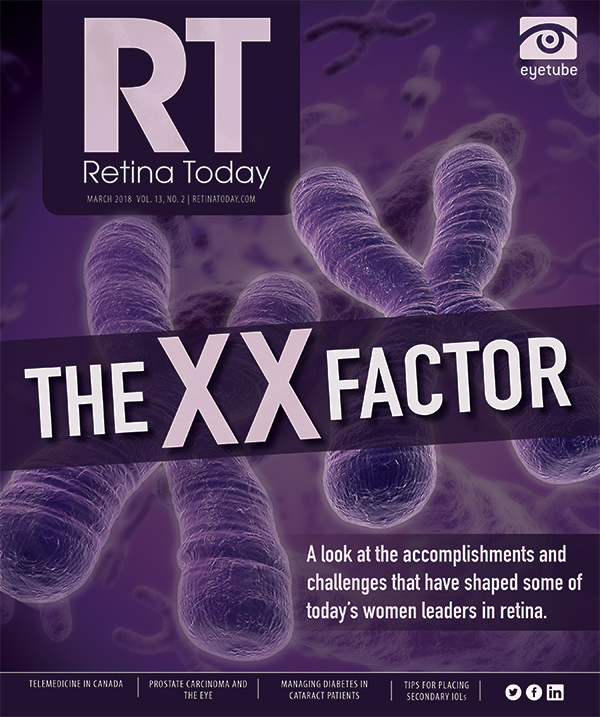 As discussed above, teleophthalmology DR screening programs can significantly reduce the need for in-person assessments, patient time, and travel burden.20 Applying teleophthalmology to optometric referrals to retina specialists reduced the number of required in-person visits by 48%.12 Teleophthalmology can also be tailored to optimally address at-risk populations through culturally sensitive methodologies. Teleophthalmology is an effective tool to overcome geographic, educational, and financial challenges. It can improve access for at-risk populations by providing direct access to ophthalmologic care from a distance. It is our hope that technology for teleophthalmology will become more fully integrated into primary care and other distributed locations to further improve access for patients with eye diseases. We look forward to a day when preventable vision loss can be eliminated. 1. Bellan L, Buske L, Wang S, Buys YM. The landscape of ophthalmologists in Canada: present and future. Can J Ophthalmol. 2013;48(3):160-166. 2. Gibson DM. The geographic distribution of eye care providers in the United States: implications for a national strategy to improve vision health. Prev Med. 2015;73:30-36. 3. Health Fact Sheets: Diabetes, 2015. Statistics Canada. https://www.statcan.gc.ca/pub/82-625-x/2017001/article/14763-eng.htm. March 22, 2017. Accessed January 30, 2018. 4. Kanjee R, Dookeran RI. Tele-ophthalmology for diabetic retinopathy in Canada-meeting the needs of a growing epidemic. Can J Ophthalmol. 2016;51(3):133-134. 5. Ross SA, Mckenna A, Mozejko S, Fick GH. Diabetic retinopathy in native and nonnative Canadians. Exp Diabetes Res. 2007;2007:76271. 6. Baker CF, Rudnisky CJ, Tennant MTS, et al. JPEG compression of stereoscopic digital images for the diagnosis of diabetic retinopathy via teleophthalmology. Can J Ophthalmol. 2004;39(7):746-754. 7. Ng M, Nathoo N, Rudnisky CJ, Tennant MTS. Improving access to eye care: teleophthalmology in Alberta, Canada. J Diabetes Sci Technol. 2009;3(2):289-296. 8. Boucher MC, Desroches G, Garcia-Salinas R, et al. Teleophthalmology screening for diabetic retinopathy through mobile imaging units within Canada. Can J Ophthalmol. 2008;43(6):658-668. 9. Rudnisky CJ, Hinz BJ, Tennant MT, de Leon AR, Greve MD. High-resolution stereoscopic digital fundus photography versus contact lens biomicroscopy for the detection of clinically significant macular edema. Ophthalmology. 2002;109(2):267-274. 10. Rudnisky CJ, Tennant MT, Weis E, Ting A, Hinz BJ, Greve MD. Web-based grading of compressed stereoscopic digital photography versus standard slide film photography for the diagnosis of diabetic retinopathy. Ophthalmology. 2007;(114(9):1748-1754. 11. Boucher MC, Gresset JA, Angioi K, Olivier S. Effectiveness and safety of screening for diabetic retinopathy with two nonmydriatic digital images compared with the seven standard stereoscopic photographic fields. Can J Ophthalmol. 2003;38(7):557-568. 12. Hanson C, Tennant MTS, Rudnisky CJ. Optometric referrals to specialists: evaluation and triage via teleophthalmology. Telemed e-Health. 2008;14(5):441-445. 13. Oster RT, Strong D, Shade S, Toth EL, Alberta D. Diabetes care and health status of First Nations individuals with type 2 diabetes in Alberta. Can Fam Physician. 2009;55(4):386-393. 14. Hooper P, Boucher MC, Cruess A, et al. Canadian Ophthalmological Society evidence-based clinical practice guidelines for the management of diabetic retinopathy. Can J Ophthalmol. 2012;47(2 suppl):S1-S30. 15. Virani S, Strong D, Tennnant M, et al; Implementation Committee of the Aboriginal Diabetes Initiative. Rationale and implementation of SLICK project: Screening for Limb, I-Eye, Cardiovascular and Kidney (SLICK) complications in individuals with type 2 diabetes in Alberta’s First Nations communities. Can J Public Health. 2006;97(3):241-247. 16. Arora S, Kurji AK, Tennant MT. Dismantling sociocultural barriers to eye care with tele-ophthalmology: lessons from an Alberta Cree community. Clin Invest Med. 2013;36(2):57-64. 17. Rudnisky CJ, Wong BK, Virani H, Tennant MT. Risk factors for progression of diabetic retinopathy in Alberta First Nations communities. Can J Ophthalmol. 2012;47(4):365-375. 18. Canadian National Institute for the Blind. Fast facts about vision loss. www.cnib.ca/en/about/media/vision-loss/pages/default.aspx. Accessed February 5, 2018. 19. Li B, Powell A-M, Hooper PL, Shedow TG. Prospective evaluation of teleophthalmology in screening and recurrence monitoring of neovascular age-related macular degeneration: a randomized clinical trial. JAMA Ophthalmol. 2015;133(3):276-282. 20. Nathoo N, Ng M, Rudnisky CJ, Tennant MT. The prevalence of diabetic retinopathy as identified by teleophthalmology in rural Alberta. Can J Ophthalmol. 2010;45(1):28-32. 21. Maberley D, Walker H, Koushik A, Cruess A. Screening for diabetic retinopathy in James Bay, Ontario: a cost-effectiveness analysis. Can Med Assoc J. 2003;168(2):160-164. 22. Kanjee R, Dookeran RI, Mathen MK, Stockl FA, Leicht R. Six-year prevalence and incidence of diabetic retinopathy and cost-effectiveness of tele-ophthalmology in Manitoba. Can J Ophthalmol. 2016;51(6):467-470. 23. Gadkari S. Innovative model for telemedicine-based screening for diabetic retinopathy in the developing world. Can J Ophthalmol. 2016;51(3):e109-e111.